Pinecones are perfect for any type of Christmas decorating. In their natural state they look fantastic in a traditional wreath and just as good as part of a table centrepiece. When the pinecone is fresh off the tree they’re often a beautiful rusty colour but beware they often fade to grey. They make a perfect filler for wreaths where you can use them in place of baubles, attach with floristry wire. 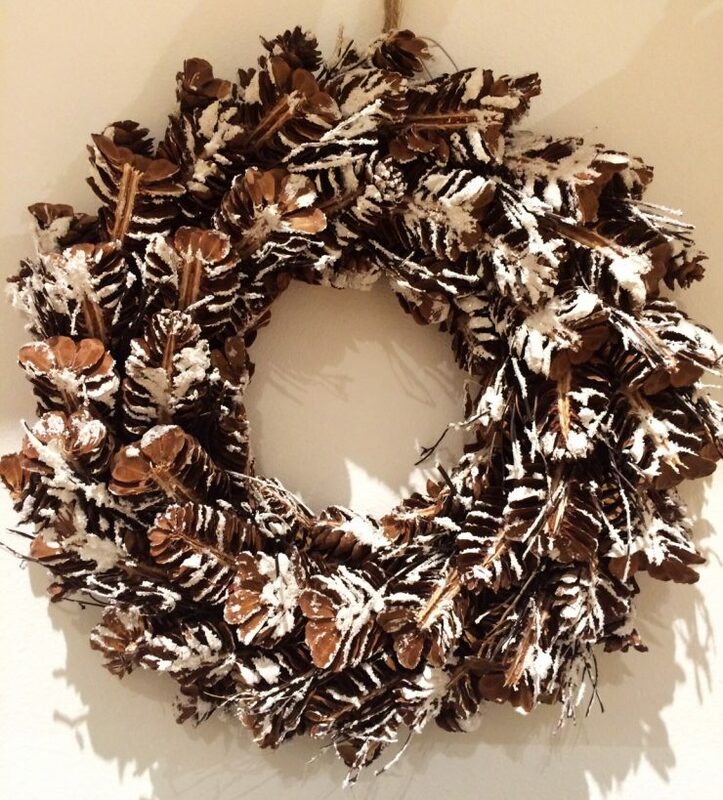 Pinecones can be sprayed, dipped, or rolled in paint and glitter. It’s great crafty fun, but reserve a weekend for collection, preparation and painting because believe me it’s a labour of love. If you want to update an old wreath try dusting with spray snow it can transform the look but it’s not a permanent fix. A very light spray with clear varnish or even hairspray will temporarily stop the snow blowing away. 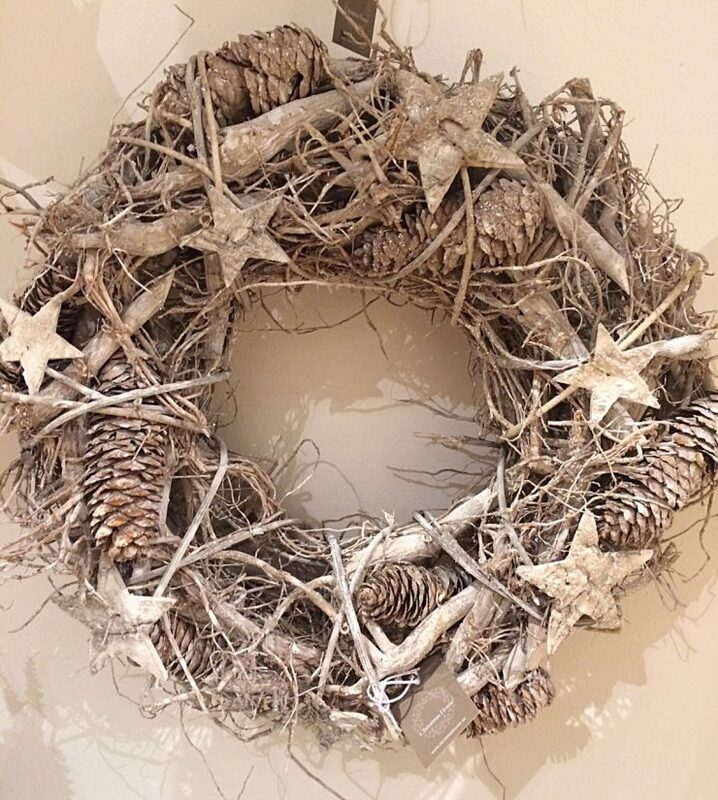 Found branches, twigs, even driftwood can be secured to a plain wreath or a metal hoop. This rustic wreath is perfect for outdoors and will only look better with age. If you decorate the house for Christmas a table centrepiece is a must. It’s not hard, scatter some pinecones and holly along the centre of the table or fill a vase with pinecones and fairy lights. For a more ‘on trend’ look this example by Edelmans is terrific. A mix of natural products like moss, twigs and bulbs work perfectly in a glass vessel. Classic Christmas colours like green, gold and burgundy are instantly brought up to date. Photo by Miss Haberdash Christmas, 2016. Edelmans display piece. Miss Haberdash Hint: a paintbrush is the perfect tool if you have to clean pinecones before painting, spraying etc.